The Hobbit has a suffered from a convoluted and often confusing production history. On top of this, the Middle-earth prequel series ballooned from an already inflated two films to a full on trilogy at the eleventh hour. I for one was particularly concerned that a 300-odd page novel and a handful of appendices would provide scant material for just shy of eight hours of film, rather like too little butter scraped over too much bread. 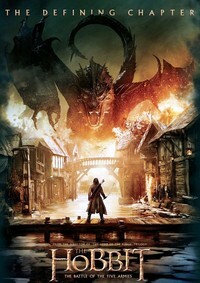 I was far from enamoured by Desolation of Smaug's many deviations from the narrative. Even worse was the apparent disregard for the more elegant and poignant elements of Tolkien's fantasy style (more on this in my alternate take). Having said that, the bit with the barrels was great, Lee Pace's Thranduil was a delight, and Smaug was pretty awesome even if he did have the wrong number of legs. It was with some trepidation then that I stepped out of my front door and into the cinema. Were my fears well founded? To an extent, but The Battle of the Five Armies is so eager to please, its visuals so sumptuous, Jackson's child-with-a-box-of-soldiers approach so charming that the film won me over. By the time the opening battle ended, it was hard to remember what I'd been so angry about. That being said, the film is still dogged by the problems that have plagued this prequel trilogy. The attempts to link up with The Lord of the Rings are clunky and overplayed, eclipsing the story of The Hobbit. The dwarves remain a largely amorphous mass, with Legolas stealing much of the limelight. Thorin (Richard Armitage) does get some juicy scenes, and Bilbo has some moments of real pathos, with Martin Freeman demonstrating that he can be so much more than a smirk when he wants to. The creature design is delightful and the sweeping battles are peppered with visual gags and moments of derring-do that really make you want to cheer. The film is heavy on exposition and more than a little feels redundant and clunky. A lot of time is spent setting out just who the five armies are, where they've come from, and why they're here now - not always effectively. It may seem that I'm more concerned with listing the films faults than singing its praises, but that's only because this is a spoiler-free review and to list the films delights would indeed spoil them. So many of the moments that made me laugh, or gasp, or weep (sometimes all three at once) did so because they were unexpected, or played out something I'd anticipated in a novel fashion. That's quite an achievement for what is essentially the sixth film in a franchise, and even more so for an adaptation. What's more, for all that Battle of the Five Armies deviates from the letter of The Hobbit, it feels a good deal closer in spirit. This review was published on December 21, 2014.